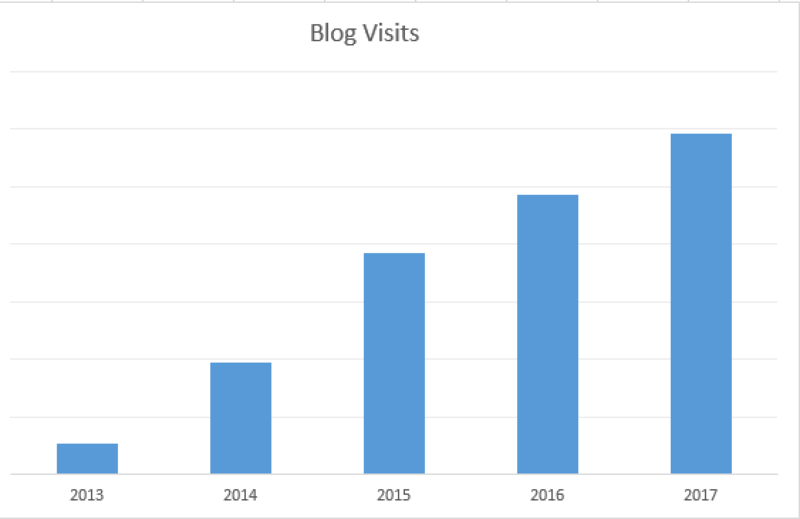 And here comes the 5th time I am reviewing what happened on the presentation an blogging side of my life, this time focusing on the past year of 2017. Like in the previous years (2016, 2015, for example), I am including the information from the previous years, in order to discover, even for myself, how things have changed in the past 12 months. 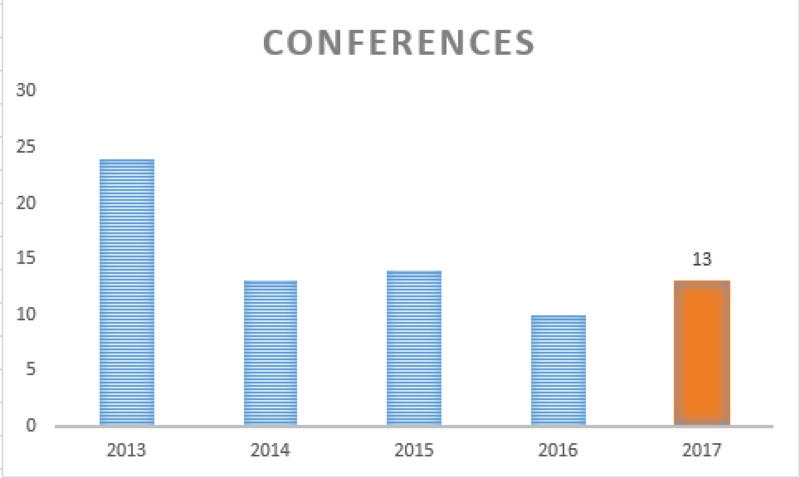 In 2017 I have spoken at 13 different public conferences, making in total 22 presentations, which is meaning that I have made a number of conferences where I had more than 1 session, making almost 2 session per conference on the average. 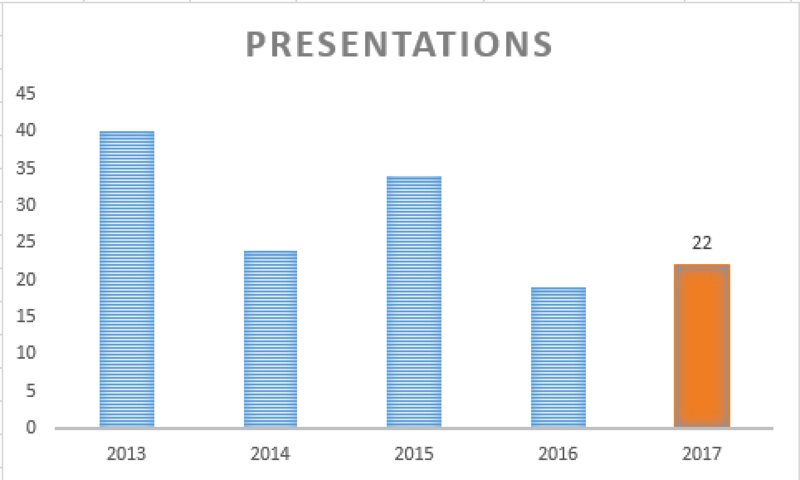 Out of those 22 presentations, there were 2 full-day precons (at SQLBits and at PASS Summit), but I have also made 5 online presentations (the biggest number ever in a year) – which was the goal of my year 2017, to make more sessions online than travelling over. I have delivered presentations in England, USA, Poland (online), Spain, Germany and Portugal. The topic of my presentations were mainly Columnstore Indexes, but I also had some In-Memory, Analysis Services and CosmosDB as well. I have stepped into the new topics and this will definitely continue in 2018, with the strategy of presenting more on the BI at the local user groups in Portugal. 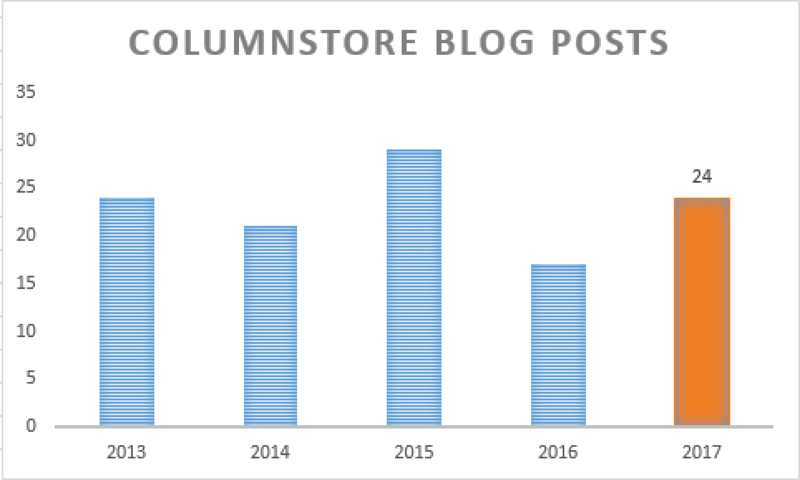 but the good news is that the year 2017 was the second most productive year for my Columnstore Blog Post series with a nice 24 new blog posts, which is one of the targets I had in mind for this year, and for which I will have to strive more in 2018. My list of the ideas and unfinished blogposts is keep on growing, instead of decreasing and challenging me with the new subjects to write on. There are a lot of smaller technical sides that were not touched before, that after finishing the most burning SQL Server 2016/2017 news, I will focus on those sides, and this should take place somewhere around March/April 2018. After a lot of delay, I have managed to ship the version 1.5 of the CISL (Columnstore Indexes Scripts Library), adding early support for the Azure SQLDW, more precise search, bug fixes, etc. I am also definitely looking forward to speak for at least 2 user groups in Germany over the course of 2018, should my travel schedule allow it, so far I have only spoken in Munich for the local user group and I would love to increase this number in 2018. 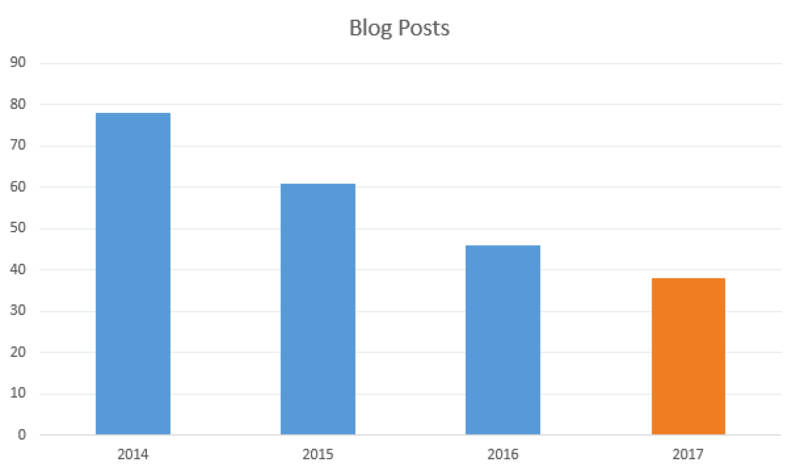 Even looking at falling trend of blogging YoY, awesome contribution, Niko. I’m looking forward to meet you in person at SQLDay in Wroclaw. I am looking forward it as well – very, very much ! Happy New Year for you and everyone as well !